I hope you're all off to a great week.....so far mine is going well & I'm keeping my fingers crossed for an excellent week all the way through! Why? My younger 2 start school on Thursday & that will be a bit of a transition for all of us. I really love having them @ home with me so it's always bittersweet for me when school starts. I'll be counting down the days for when there's no school for Holidays and finally summer break LOL! Anywhooo, onto my post for today. We have our downline meeting tonight and we swap cards @ this event.....I totally did NOT feel like making anything since I'm still recouping from all the Convention hoopla & the hundreds of swaps I made BUT my 2nd & 3rd level uplines always have the cutest cards as do my downlines Teresa & LaToya! I had to make a few so I wouldn't feel completely left out ROFLOL!!! I used another one of the stampsets we received @ Convention called Hello Again---I LOVE it---to make my simple swap card. Yes, I said simple but it has texture, a couple of layers & I think it's pretty cute---besides, that's about all they're going to get out of me right now!!!! I need to gather my notes and a few projects to share from Convention so I better get going. Thanks so much for stopping by and have a great rest of the day! Jackie, this is lovely! 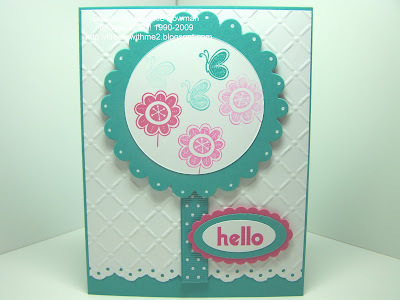 The color combo works perfectly with the "frilly" feel of the card - great job! great card and awesome colors. This is a beautiful card, so very cheerful in color! simply wonderful! This is so cute! I was thinking of getting this set. I love the colors. Great blog and lovely cards! Gorgeous color and texture on this card, Jackie! Blessings to you! This turned out really pretty! Love it! Hey Jackie, I'm still playing catchup from convention too. I love your card, especially the eyelet punched edge with the embossed background. The colors are cool and refreshing. Sorry we didnt connect at convention. Maybe next time. Yes Jackie it is simple simply beautiful I love the soft colors and the embossing I would be more than happy to get that card in a swap. oh this is stunning. it looks like a tree! i love it! I really like the texture you used. Hard to believe school is already starting back up. Seems like just yesterday that they got out for the summer. I love the textured background and the layout! I am sure they will love it. I can imagine how burnt out you are! This is amazing Jackie! Hang in there about school. I know it must be hard! This is really cute, I really like the polka dots! Love the white! Simple card??? Looks like a WOW! card to me! Great card! I'm sure they loved it! TFS ;)! Glad to see you are back. Your card is wonderful, as always. I really like the layout and the textured panel. This is so cute! I'm sure they will love it! Such great colors! That texture plate is really wonderful - nice work! It is adorable! Have a great meeting! Lovely lovely card Jacquel! Glad you had such a blast at convention. The first European one is in Germany this year, but next year we think it will be at the UK and I will definately be there. Looking forward to seeing the results of all that you have learned. You are always such an inspiration. Jackie, what a beautiful card!! I just love the crispness of it!! I love the color!! This is sooo pretty, Jackie!!! I love the Bermuda Bay and Melon Mambo color combo and the scoring in the background looks AWESOME!!!! !